On June 1st, 2012 “A Life With A Purpose” and Heintz & Weber donated $ 5000.00 to Parent Project Muscular Dystrophy from proceeds of book sales from the first two months since the book’s release… Please continue to support our mission. The photo is part of a Feature on Francis’ and Steven’s book which was published in The Buffalo News on June 15th, 2012. Photo by Harry Scull, Jr. You will also find a complete listing on Facebook about the book and media attention links. Francis “D” Desmond, the oldest son of Heintz & Weber Owners Steven & Suzanne Desmond was diagnosed with Duchenne Muscular Dystrophy on January 4, 2007. 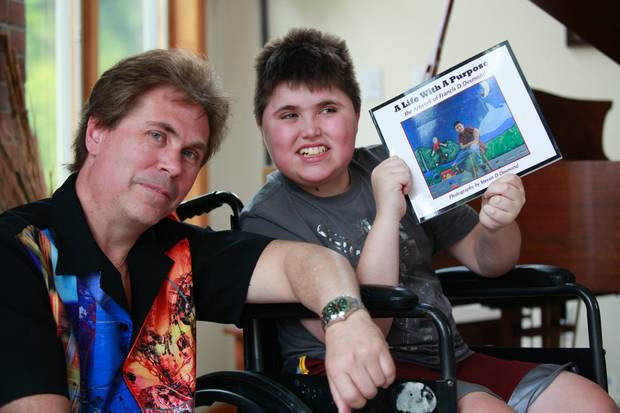 Francis, an incredible artist, along with Steven, a multi-awardwinning professional photographer and photojournalist, published the book “A Life With A Purpose” to raise awareness and much needed dollars for Muscular Dystrophy research. As of today- sales of the book has raised and doanted more than $ 8,500 to research. Please consider purchasing a copy of this wonderful coffee table art book. $ 35.25 delivered direct from Heintz & Weber and 100% of your money spent goes to research through Parent Project Muscular Dystrophy.